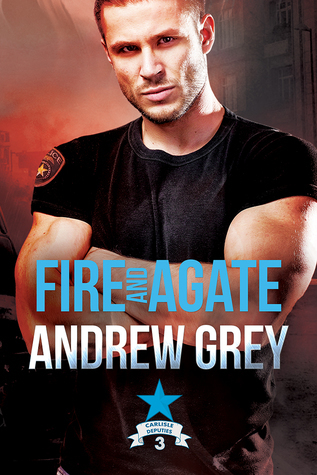 Fire and Agate is the third book in the Carlisle Deputies series by Andrew Grey. I loved this book. I just couldn’t put it down. The writing style is easy to read and has an easy flow to it. Andrew Grey did it again with a wonderful plot and complex characters. I loved how Pavle and Chris interacted and the chemistry they had together. I also loved the supporting characters like Briggs, Pastor Tyrone and his family, Nanna, and the social worker, Marie. They were all there to help and support Pavle, and I thought that was wonderful. My only complaint with the story would be that they don’t say who the leak in the sheriff’s department was. Otherwise, I loved how the story ends. Chris Anducci has recently moved from jail duty to working in the sheriff’s office. He doesn’t expect his first assignment to be protecting a witness against a human trafficking ring. Even though he doesn’t have a lot of experience protecting people, he knows that the new sheriff doesn’t abide screw-ups and so Chris reluctantly agrees to work the case. He has no idea just how much he will come to admire and care for the young man that he’s assigned to protect. I loved how he puts aside his attraction and makes sure that he never does anything to distress Pavle. Pavle Kasun has spent the last four years of his life at the mercy of others. When somebody finally moves in next door, it’s the opportunity that he’s been waiting for and it ends up resulting in his rescue. However, the safe houses that he’s been placed in are being threatened by people that don’t want him to testify. He’s going to need protection if he’s to have any chance at a life. I really enjoyed Pavle. He has a spine of steel and doesn’t let what’s happened to him stop him from going after what he wants. He very much wants to live in the future and not the past. I loved his interactions with Nanna. They always made me laugh. I loved that Chris opens his home to Pavle and how Pavle comes out of his shell and how Chris doesn’t turn his house into another jail when Pavle wants to go to church. I also loved how protective he is of Pavle when they realize that there’s a leak in the department. I just wished that we got to find out who the other leak was in the department besides the person who was named. And of course, I loved the chemistry between Pavle and Chris. Overall, a great story and a great addition to the series. I can’t wait until the next book comes out.